This was the cover photo of the crappy plastic album I had stored the photos in. 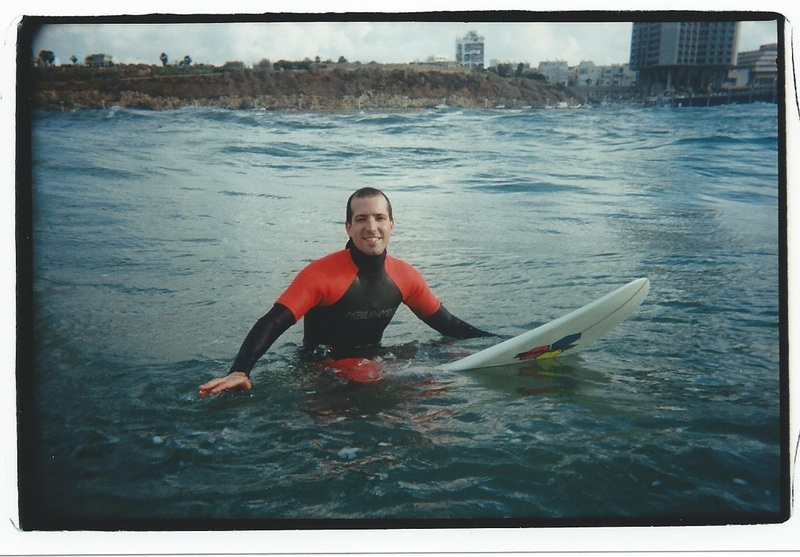 I lived in Israel From 1994 to 2001, most of that time in Tel Aviv. 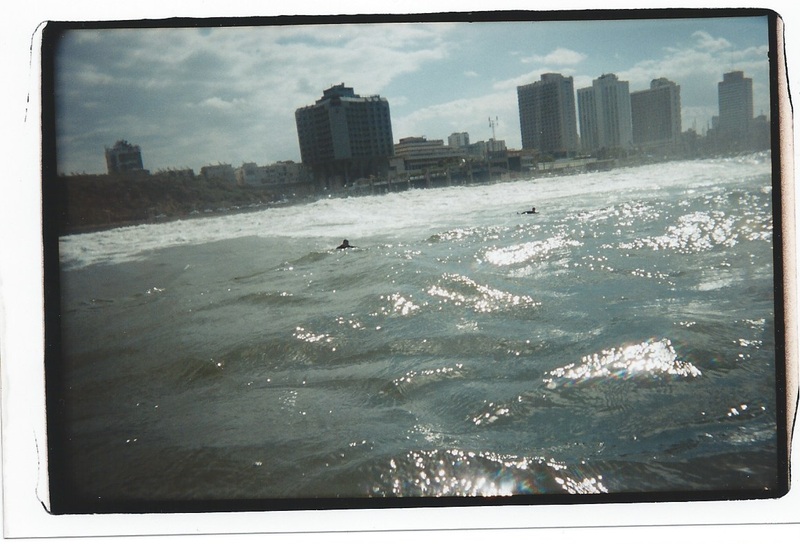 Some of that time I had the most perfect situation of living on Zlotopolski St, across the road from an excellent surfing break called Hilton Beach, named for the hotel that loomed over it. 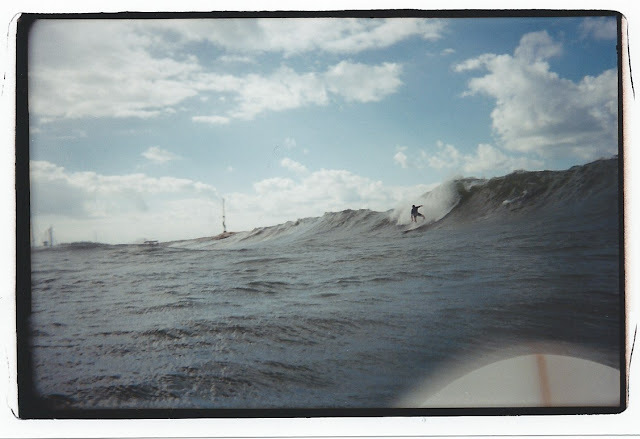 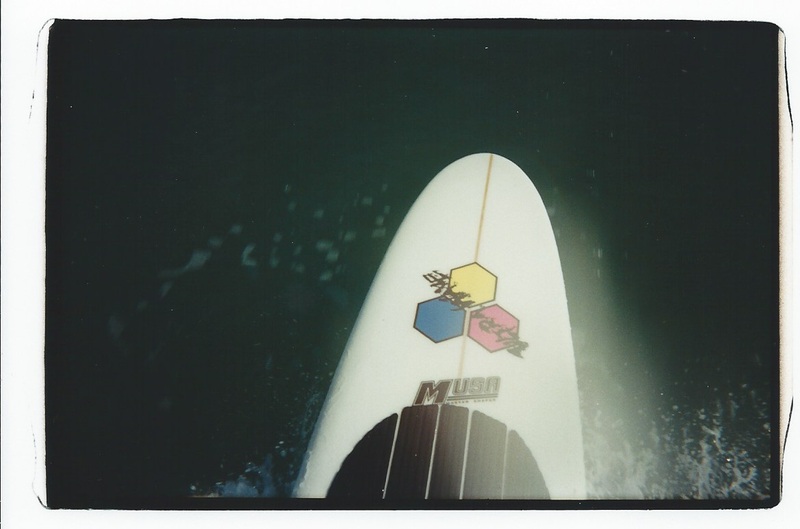 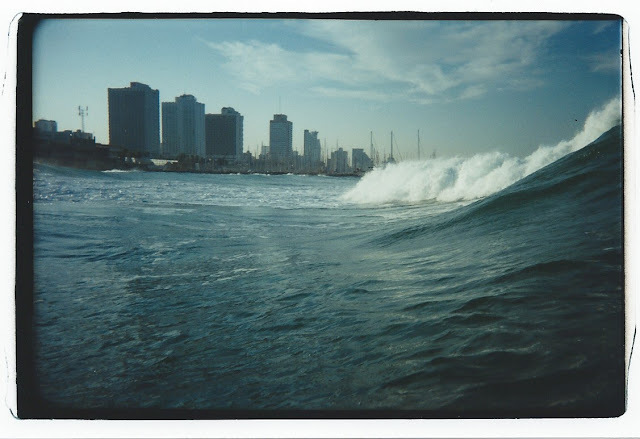 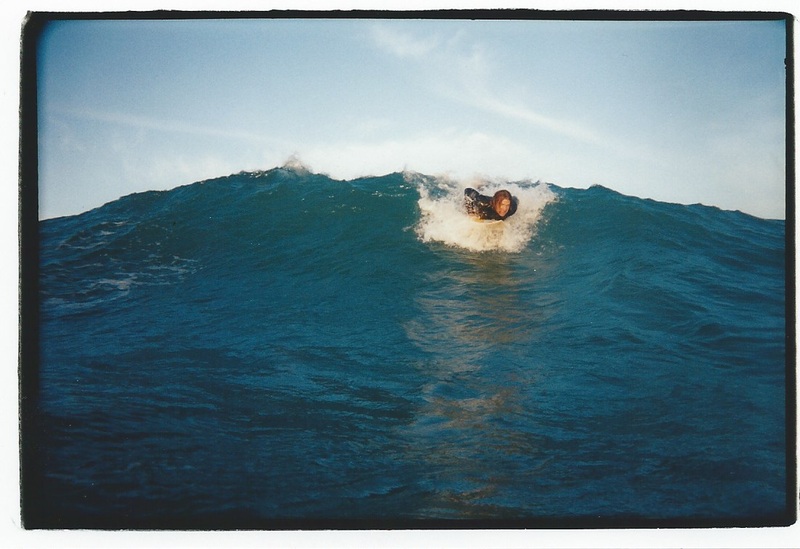 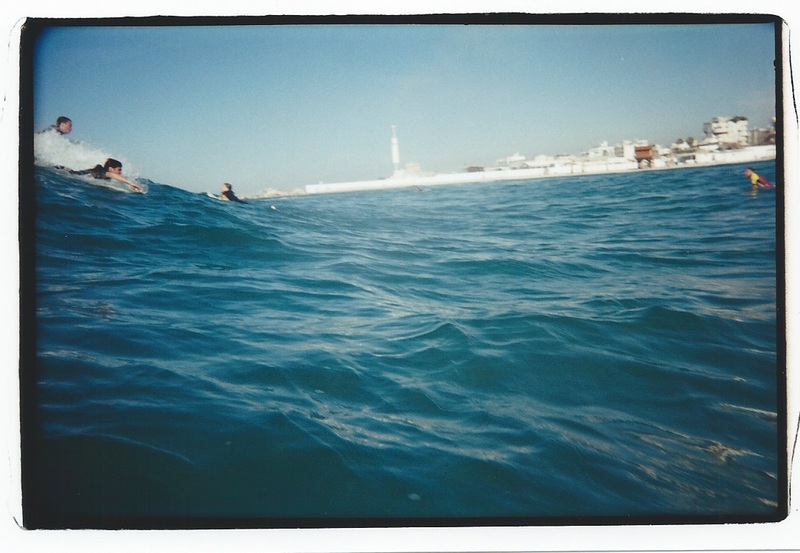 My last couple of years I wanted to document my surfing life by taking a camera out into the water. This was still the age of film photography and I didn't want a fancy rig, as I needed to be able to stow the gear and just surf. I settled for waterproof disposable cameras that I kept in a fanny pack, breaking out when the mood came over me. There were plenty of days when the camera never came out once as I was just having too much fun. 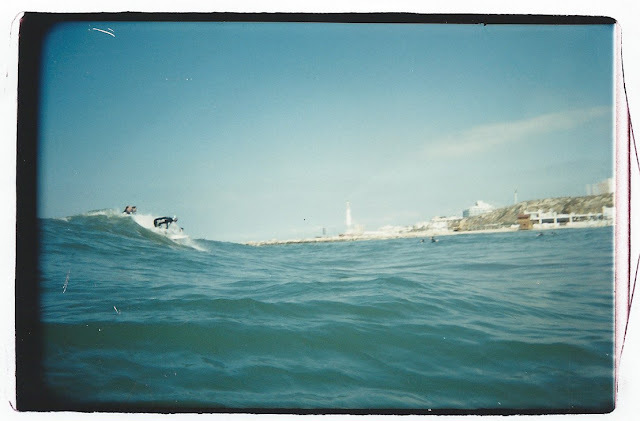 The cameras were really hard to use as the shutter was relatively slow and the wide angle lens made all but an assured collision look far away. 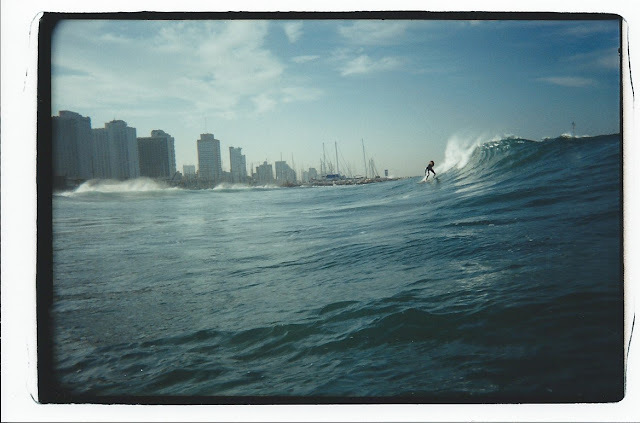 Adding to these issues was the fact that as I was floating on a surfboard myself, being still to snap the shutter at the right place and time was equally formidable. 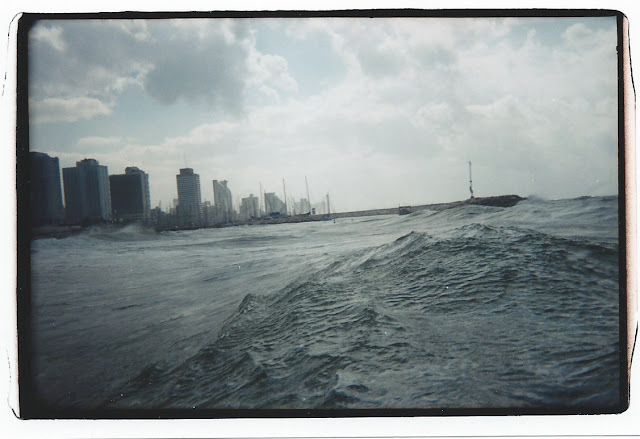 I went through about 15 cameras over the years, throwing most of the photos away. 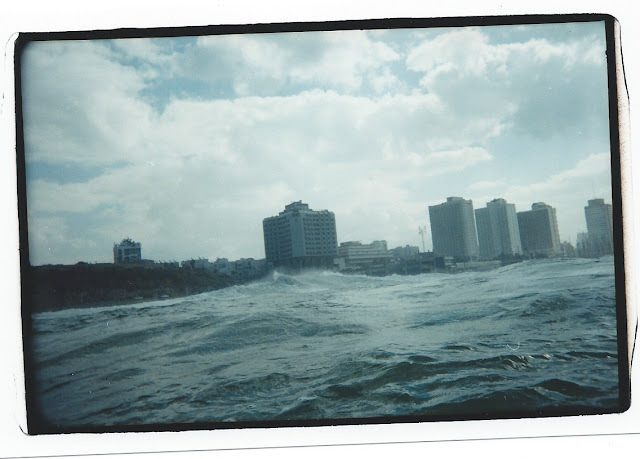 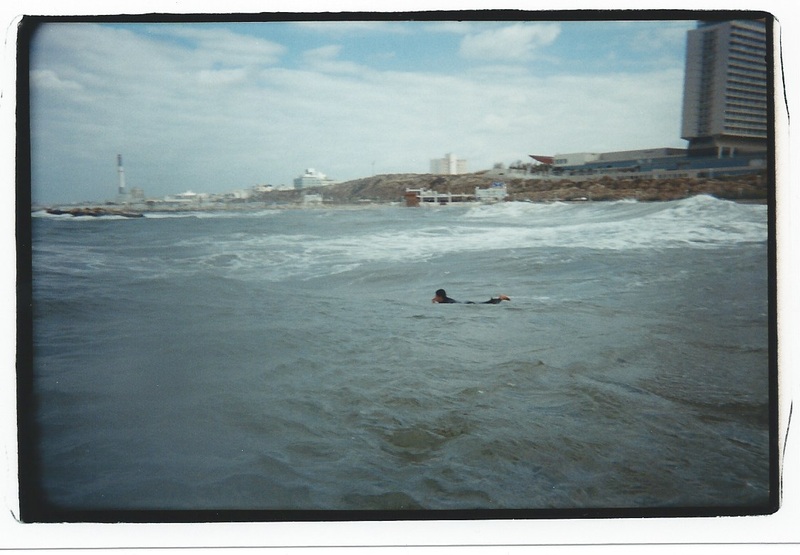 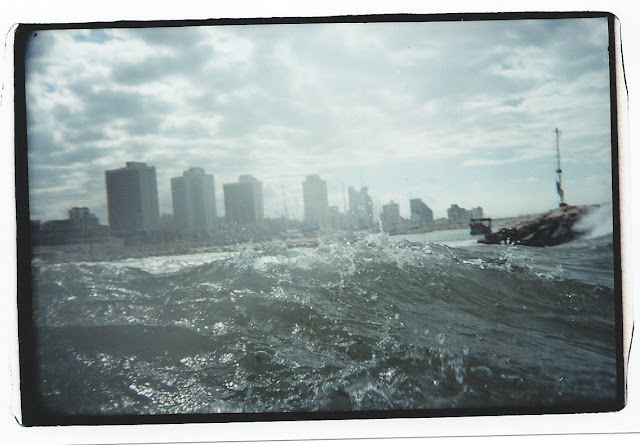 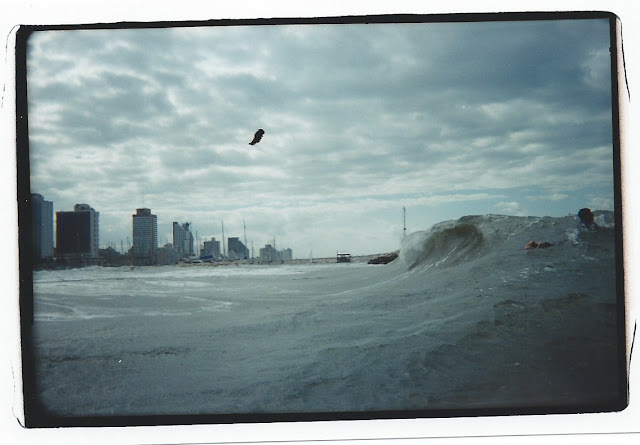 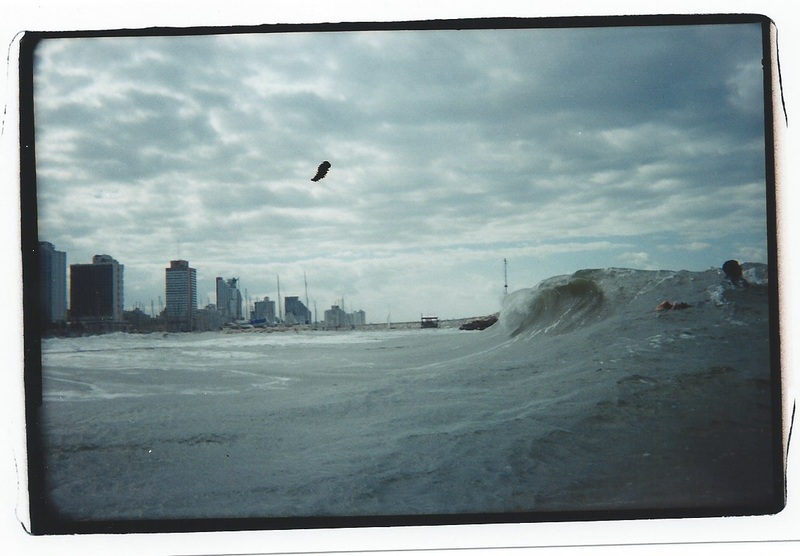 The 60 snaps that I chose to keep I believed, in some way, told the story of my Tel Aviv surfing. During that time I liked having my film printed to the edge of the emulsion which accounts for the interesting borders. 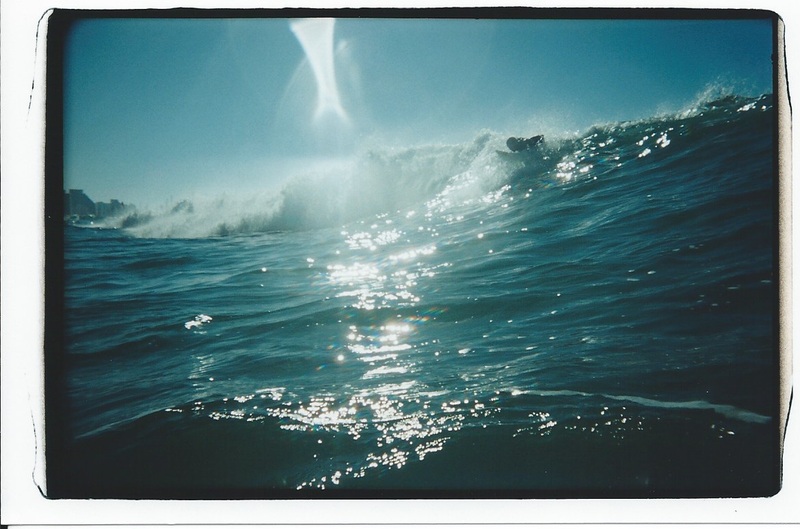 To my kids, these pictures are the real thing, not a filter. Part of wanting to put all of these shots on the blog has to do with the aging of the film and the worry that in another five years all the color will have faded out. I will be putting all the photos on the blog in their original order, with perhaps a comment or two. 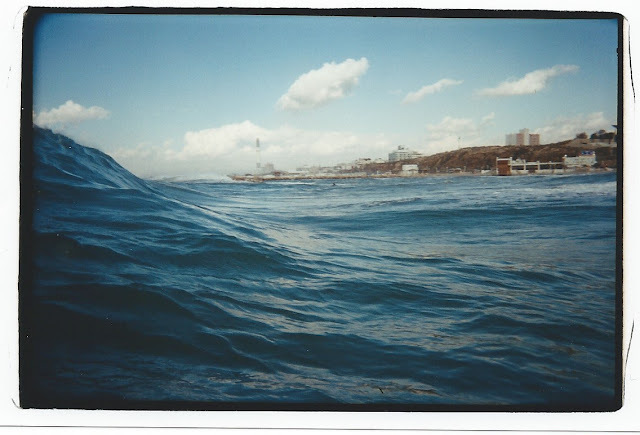 When looking at the sky and sea, the unbridled joy on the faces of myself and my friends, I know I have lived a good life. Stoke! Yours truly back in the day. 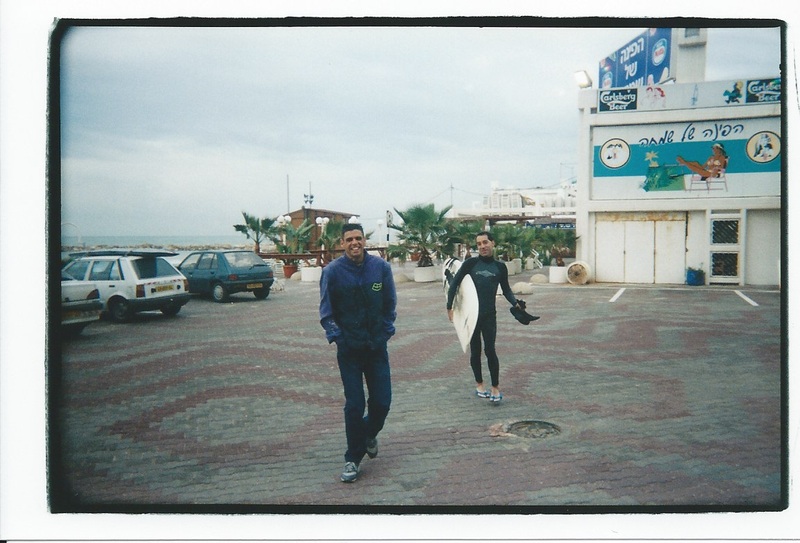 These guys made even the flat days fun. 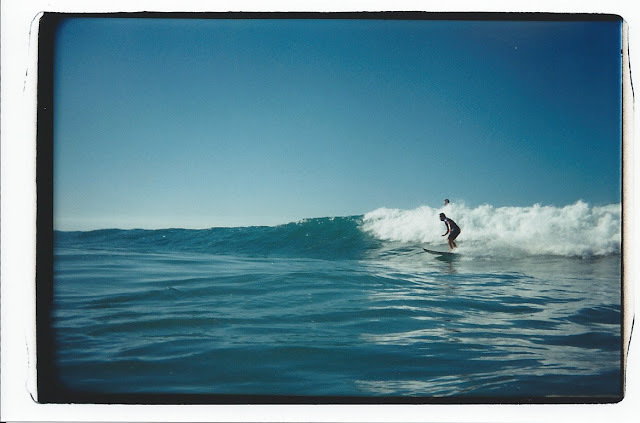 I tried many times to take off with the camera in my teeth, pop my stance, and get an interesting shot. 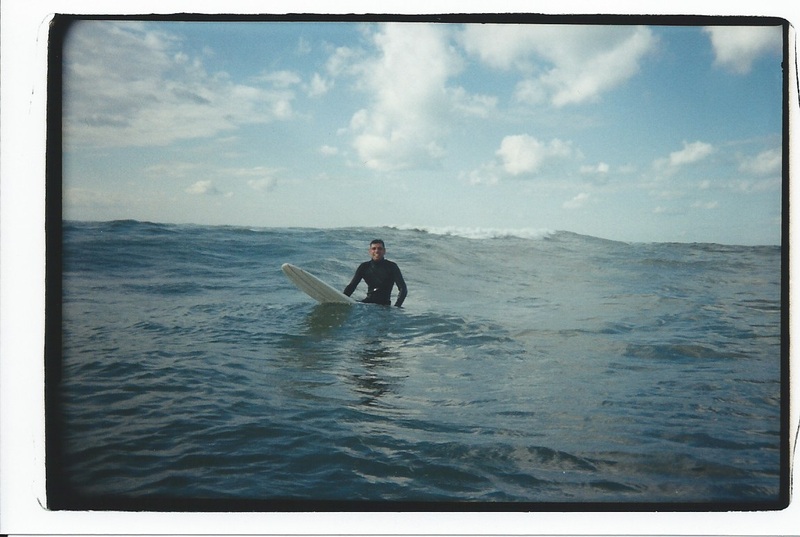 Alas, this was the best result. 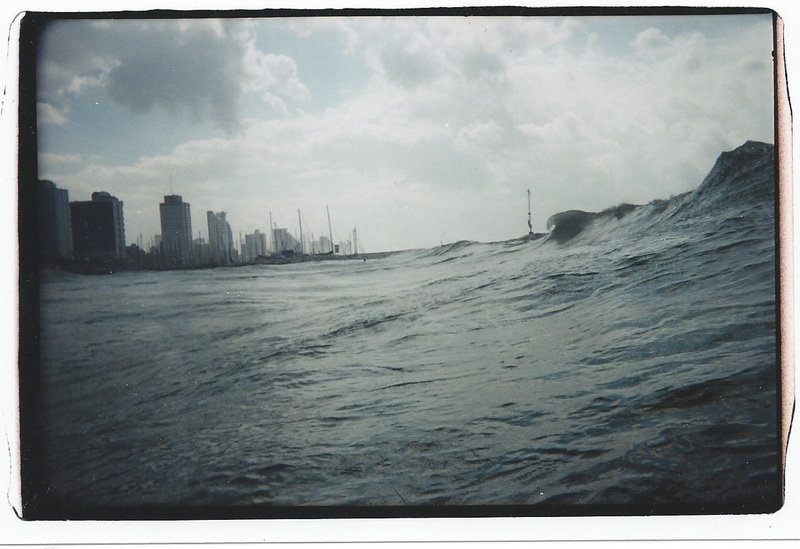 This will be a three part series.